One of the most ignored problems facing a modern army is supplying artillery ammunition to mobile forces. Since World War II, newer artillery guns have increased rates of fire and use larger calibers of ammunition. This new burden was not recognized during the Cold War since artillery ammunition was simply stored where needed for defense. However, expeditionary operations require the movement of ammunition from ships to the battlefield. In the US Army, each 155mm gun is expected to fire an average of 205 rounds a day. This means that each heavy "armored" division with 54 155mm guns needs 11,070 rounds a day, or 554 tons of 155mm ammo a day, which requires 111 5-ton truck deliveries EACH DAY. This amount was never available during the 1991 Gulf War and artillery units were constrained to firing at battalion-size targets due to a lack of ammo, AFTER SIX MONTHS OF LOGISTICAL BUILD-UP! And of course this is just ammo, fuel for these trucks and the huge self-propelled artillery guns is required, plus food and other support. The reason modern artillery can't keep up with mobile forces is not the problem of moving the guns, but moving the ammo. A major problem is the way munitions are safely and economically packed for shipment. Unpacking artillery rounds, bag charges, and fuzes is manpower intensive. A 155mm Paladin howitzer with 40 rounds, supported by its M992 FAASV resupply buddy (above) with 60 rounds, can fire those 100 rounds in 25 minutes. The Army says a FAASV supply vehicle can be reloaded in 15 minutes, but by whom? If a battery is lucky, a column of trucks loaded with 155mm rounds is following behind. How many HOURS does it take them to offload, unpack and reload several FAASVs? Resupply is where the artillery units collide with the logisticians. The supply system wants trucks carrying a load forward, followed by immediate unloading and return for another trip, because a heavy division needs 111 truck loads a day delivered. This results in the creation of huge ammo dumps scattered over the battlefield. If tactical movement becomes necessary, the artillery unit drives away and leaves these dumps behind. The alternate method is to use supply trucks as rolling magazines following tactical units around the battlefield. Artillery battalions love this approach, but it's the last thing division and corps supply officers want for obvious reasons. This problem is magnified because enemy counterbattery radar can instantly locate a firing battery. Therefore, tactical doctrine for an artillery battery is to "shoot and scoot" i.e. move to another location immediately after firing a volley. While this is possible for self-propelled artillery under armor, it doesn't explain what the gaggle of supply trucks, forklifts, and pallets of ammo can do to evade destruction. "Modern US/NATO/allied field artillery is based on two calibers: 105mm for light artillery and 155mm for medium artillery. The deep battle roles of interdiction/counter-battery/suppression of enemy air defense have been taken over by MLRS and ATACMS. Artillery rounds come in two forms: semi-fixed for light (105mm) and separate loading for medium (155mm) and larger calibers (175mm/203mm). Semi-fixed means the projectile comes on a canister that contains powder increments in bags (called charges) that are numbered 1 thru 7. When the command is given to fire "Charge 4", bags 5, 6 and 7 are removed from the canister, the projectile is seated back on the canister and a fuze is screwed into the projectile nose, then set according to the mission. The round looks like a fixed round (i.e., rifle cartridge or tank round), but is actually three components: 155mm ammunition is separate loading with a projectile, a fuze placed and set on the projectile and powder increments placed behind the fuzed projectile once it is rammed into the howitzers. Think cap and ball black powder, breech-loaded firearms and you see how it works. Semi-fixed 105mm rounds come in a wooden box with two rounds inside cardboard tubes to keep them weatherproof. Fuzes come in a small ammo can-like box for the standard Quick (impact) fuze. Other fuzes come in their own cardboard containers in small boxes. This creates a problem with dunnage (trash) at a firing position. Empty wooden boxes were used by troops as sandbags when filled with dirt around a firebase. I don't believe this has changed much since at least WW2. I know that was the standard in Vietnam. A box weighed about 70 lbs., and was normally carried by 2 men. If there was a "Universal" fuze, capable of being set on Delay (cratering/penetrating action), SuperQuick (standard impact detonation), Low Air Burst (2-3 meters above ground), Variable Time (for Smoke/Illum/APERS) or Proximity (air defense) that was loaded on the projectile at the shipping point, with multiple safeties to prevent premature detonations, you might be able to reduce some of the handling problems. An electronic fuze was under development some time ago, but I have no idea of the current status of the program. 155mm projectiles come in 8-packs: wooden base and top strapped together, lifted onto the ammunition vehicle by a crane. Powder comes in metal tubes with screw-off ends. Fuzes come separately, as with 105mm rounds. A standard HE 155mm projectile weighs 95 lbs., with the full powder canister weighing at least 15 lbs. 175mm/203mm projectiles were moved in 4-packs; the 175mm weighed over 150 lbs and the 203mm was over 200 lbs. Navy 127mm guns are also separate loading, but automated. Since the 105mm is towed, unless it is motorized for the Brigade Combat Teams, the ammo is on the back of the prime mover vehicle, with re-supply accomplished by trips to Service Battery, or delivery to a position by Service Battery's Ammo Platoon. 155mm towed howitzers (M198) for both the Army and Marines have the same situation, but complicated by the increased size and weight of the projectiles and powder. Self-propelled 155mm (M109A6 Paladin) howitzers and the new Crusader howitzer have a dedicated protected (I refuse to call it armored) FAASV (Field Artillery Ammunition Supply Vehicle) which looks like a howitzer without a moving turret and no gun. 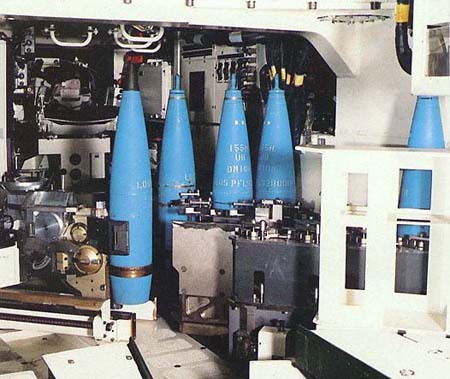 The concept is to have the FAASV sit behind the howitzer, with a part of the gun section preparing rounds and powder in the FAASV, then moving it to the howitzer on a connecting ramp by a conveyor belt-type mechanism which places the fuzed projectile and powder increments in the howitzer. The problems are several as you can see. First, it is labor intensive; second it is bulky; third, there is a limit on what is available to fire at any given time; fourth re-supply by moving the FAASV back to the Service Battery ammo point is time consuming, even though there is equipment to load the FAASV quickly. Fifth, the numbers game with personnel is an Artillery problem, also. 105mm solutions: use something like the rack system that the M1 tank has, allowing the round to be extracted quickly. It would have to have a downward slant at the canister base, so when a release was tripped, the round would slide canister first into the cannoneer's hand. Make the racks of engineered polymers (plastic), each tube a separate sealable holder. Make the rack solid on 5 sides to prevent damage, with simple bolts to fix them onto a vehicle bed or wall mount that can be accessed by a crane. If you could seal the remaining opening with 6-mil plastic film, you reduce the dunnage problem greatly. Rounds would be grouped by type: HE, Smoke/WP/Illum, APERS/HEAT/HESH/HEP, in colored racks. Same system concept for fuzes, with color codes to identify them as Quick/Time/VT. Sections could have a "limber" type 1/2 ton trailer that carried 80 rounds pulled by the prime mover, with the 105mm connected to the limber. A rack trailer could pick up empty racks for reloading at an Ammunition Supply Point (ASP), and an ammo vehicle, like a 5-tn/HEMTT with trailer could be co-located with the battery. The trailer would be emptied first, then moved back to the ASP for re-loading. Material handling equipment (MHE) helps, but it doesn't obviate the need for personnel. Ammo vehicles need some sort of applique armor to prevent "cheap kill" syndrome, as do the gun positions. The 155mm problems are far more intractable. The sheer size and weight of the objects mean MHE is badly needed, but shipping them to the ASP might be addressed if we use the concept of a protected container on a HEMTT/PLS system. Use one for rounds and one for powder/fuzes. Again, maybe racks might work. If racks are helicopter-usable for rapid, emergency re-supply, sling-loaded or interior carried, you still need MHE on the firing position to move the racks. The German PHZ 2000 (left) has a 60-round autoloader, but must be hand loaded itself. Reducing the number of tubes per battery is an option, but the loss of a tubes leave a maneuver battalion with less firepower when really needed. Maybe reducing the battery to 4 tubes will help with ammo supply without critically endangering the mission when losses are suffered, but I would prefer going back to 8 myself. If we did away with mess teams, using on-vehicle (track or wheeled) heating equipment for MREs or Section tray packs (set up for the number of people in a section [6, 7 or 8] rather than 10), meals/water could be handled with normal re-supply. That might free up some slots for the Ammo Platoon. The needs for a battery will vary greatly with the situation. Guerilla war would require more overhead protection and towed guns capable of helicopter movement. They tend to be infantry wars. But we don't know the shape of the guerrilla wars of the 21st Century yet. Is it going to be information intensive? With a problem that small groups of guerillas can pack a big wallop? Do we need more light guns? No MLRS? A Kosovo-type might require fewer guns, but more attack helicopter assets, since artillery tends to be a blunt weapon, and the scalpel might be far more necessary. Again, what is the rate of fire per day/per gun set by the highest headquarters? 20? 50? What kind of rounds? Can you squirrel some rounds away for a rainy day situation? How are you going to move all this stuff? The old adage "size does matter" applies here and with size comes weight. Until some other means of propelling projectiles down range with accuracy is developed, we are stuck with powder and shot."